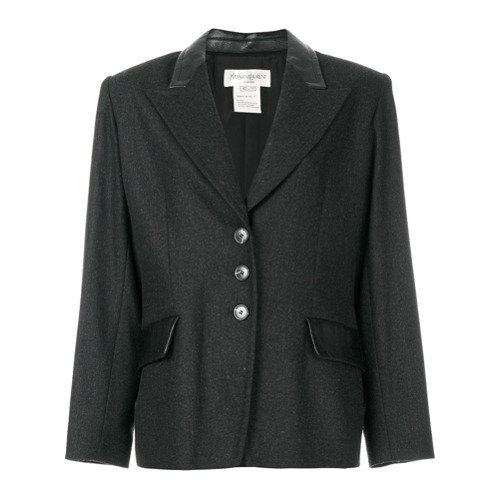 If you're hunting for a casual yet stylish getup, pair a Yves Saint Laurent Vintage peaked lapels blazer from farfetch.com with charcoal skinny jeans. Both pieces are totally comfy and will look fabulous paired together. Choose a pair of burgundy suede ankle boots to va-va-voom your outfit. Team a Yves Saint Laurent Vintage peaked lapels blazer with blue ripped boyfriend jeans, if you want to dress for comfort without looking like a hobo. Up the cool of your look by complementing it with silver leather oxford shoes. 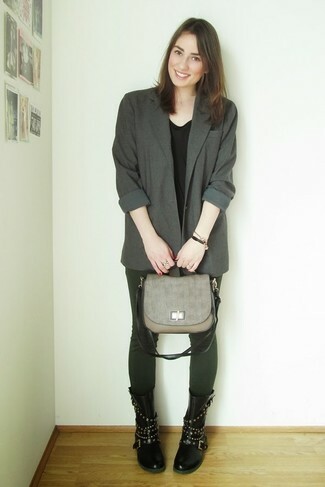 If you're obsessed with functionality dressing when it comes to fashion, you'll love this uber cute pairing of a Yves Saint Laurent Vintage peaked lapels blazer from farfetch.com and dark green leggings. When it comes to footwear, this outfit is finished off nicely with black studded leather lace-up flat boots. 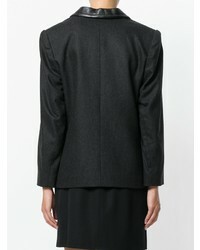 If you're obsessed with relaxed dressing when it comes to fashion, you'll love this adorable pairing of a Yves Saint Laurent Vintage peaked lapels blazer from farfetch.com and charcoal leggings. Amp up the cool of your ensemble by wearing brown suede knee high boots. If you're hunting for a casual yet absolutely chic ensemble, opt for a Yves Saint Laurent Vintage peaked lapels blazer and burgundy print jeans. Both pieces are totally comfy and will look fabulous paired together. To bring out the fun side of you, complete your outfit with beige leather ballerina shoes. If you're searching for a casual yet chic ensemble, consider pairing a Yves Saint Laurent Vintage peaked lapels blazer with black leather skinny jeans. Both pieces are totally comfy and will look fabulous together. And if you want to instantly up the style of your look with one piece, enter navy suede pumps into the equation. If you're all about feeling relaxed when it comes to dressing up, this combination of a charcoal blazer and black leather leggings is what you need. Elevate this getup with black leather pumps. If you're in search of a casual yet absolutely chic look, rock a Yves Saint Laurent Vintage peaked lapels blazer from farfetch.com with white dress pants. Both garments are totally comfy and will look fabulous paired together. Want to go easy on the shoe front? Go for a pair of white leather flat sandals for the day. If you're obsessed with functionality dressing when it comes to fashion, you'll love this adorable combo of a Yves Saint Laurent Vintage peaked lapels blazer and light blue ripped boyfriend jeans. Amp up the cool of your outfit by finishing off with tan leopard suede loafers.